A new series on some of the best children's books ever written. I'm going to discuss my favorite children's books - from the ones I liked best as a child to new discoveries. First up: an Astrid Lindgren book - a mainstay of my childhood which T's just getting old enough to enjoy. 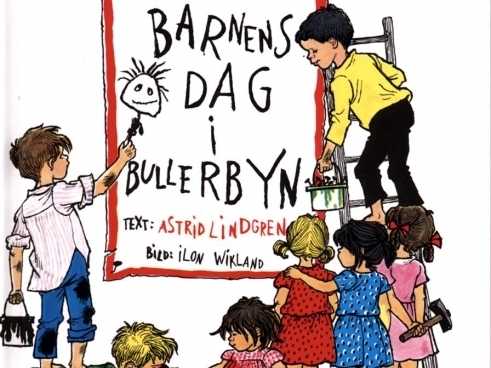 When discussing Astrid Lindgren's books ('cause I'm definitely going to write about more), I'm going to try to stick with the original Swedish character names as far as I have them, and the Swedish place names (so "Bullerbyn" and not "Noisy Village," and "Emil," not "Michel"). 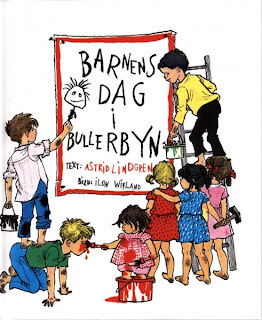 The big kids of Bullerbyn (three girls - Lisa, Anna, and Britta - and three boys - Lasse, Bosse, and Ole - all aged seven to ten) want to organize a fun day for the littlest one, Kerstin, who's two and a half - partially so she doesn't bother them as much on the other days. The boys' idea of a fun day turns out to be too much for Kerstin, but following the advice of Kerstin's mother the girls show the little one just how lovely Bullerbyn is. Kerstin gets a tour of the farms' animals, followed by cinnamon rolls and juice, and then even the boys have a special (and age-appropriate) surprise for her. By the end of the book, she's tuckered out and fast asleep in her bed. It's a cute and entertaining story with realistic but very low-key drama. T definitely identifies with Kerstin - who wouldn't want to be queen of the day with the big kids dedicating themselves to her? - and it's a good "and now it's time for you to sleep too" story. Even though the big kids' plans are initially too much for Kerstin (like...having her ride the pony and dangling her out of the window on a rope), it's clear they mean well - but though the kids are fairly autonomous, they do need some adult guidance to know "what's right" (this stands in stark contrast to the Pippi Långstrump books, and even in the other Bullerbyn books they normally figure things out for themselves). The entire Bullerbyn series is very episodic - the kids don't really experience any character growth or change, unlike the characters in the Madicken series (which is a lot darker). But it's nonetheless timeless and comforting on a very fundamental level. PS: It seems there is a new German edition with illustrations by another artist - blasphemy. I found out about it on this (German) Astrid Lindgren fanpage.